Otius Loran is an Imperial priest and the Primate of the Great Chapel of Stendarr in Chorrol. Like the other residents of the Chapel, Otius sleeps downstairs in the Chapel Hall, preferably in the southern bedroom. He rises early at 4am and immediately heads up into the main chapel and spends his morning there. At 8am, he positions himself in front of the Altar of Stendarr and receives a single blessing. At noon he leaves the chapel and goes down the street to the Oak and Crosier and hangs out there for four hours. At 4pm, he heads back to the chapel, receives another blessing from Stendarr and just wanders around until his early bedtime at 10pm. He wears a black & burgundy outfit with gold trimmed shoes. He carries around a spare green silk garment and a large amount of gold. Otius knows a leveled set of priest spells, as well as one extra major Restoration spell. 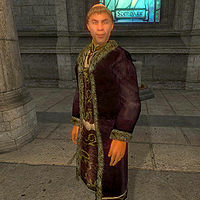 Otius takes his position as Primate seriously, which becomes apparent when you approach him for the first time: "I'm Otius Loran, Primate of Stendarr. You stand before Gods' servant, in the house of the Nine. Be humble, and show respect." If you have installed the Knights of the Nine official plug-in and started the quest Stendarr's Mercy, Otius will point you towards newcomer Areldur for more information on the Gauntlets of the Crusader: "The gauntlets, eh? They're Areldur's responsibility. Speak to him about them." Esta página foi modificada pela última vez à(s) 20h51min de 25 de abril de 2013.